Cuban human rights activist Elizardo Sanchez reported today that there currently are 167 political prisoners in the Castro gulag, the lowest number in 51 years. Presuming that number is accurate -- by my count, which I concede is not complete, there are at least 213 Cuban political prisoners (I just counted the names listed on the right sidebar -- Sanchez's report is nothing to celebrate. As long as there is a single political prisoner in Cuba, no quarter should be given to the regime that imprisons him. 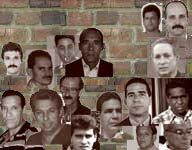 For the names of the 167 political prisoners counted by the Cuban Commission on Human Rights and National Reconciliation, click here. For the names of the "prisoners of conscience" recognized as such by Amnesty International, go here.